Just minutes after Meath had secured promotion back to the top flight for the first time since 2006, Bruce Springsteen's 'Glory Days' blasted out over the Páirc Tailteann PA system. This wasn't quite a return to the heady times when Meath dined at football's top table but it was at least a step in the right direction. They came into the game in a peculiar position. A draw or a win would guarantee them passage to the top flight while they also had a healthy score advantage over their rivals if it came to it, meaning only a heavy defeat to the division's lowest scorers would put them in jeopardy. And for a few minutes at least, Fermanagh had the ship pointed in the right direction. Playing with the aid of a stiff breeze, they kicked four points inside the first four minutes, committing as many bodies to attack as defence on occasion. And might have stretched that lead to seven or eight but for some wayward shooting. By half-time, they had kicked 11 wind assisted wides. Fermanagh's style of play has come in for criticism but here it was their execution that was letting them down. 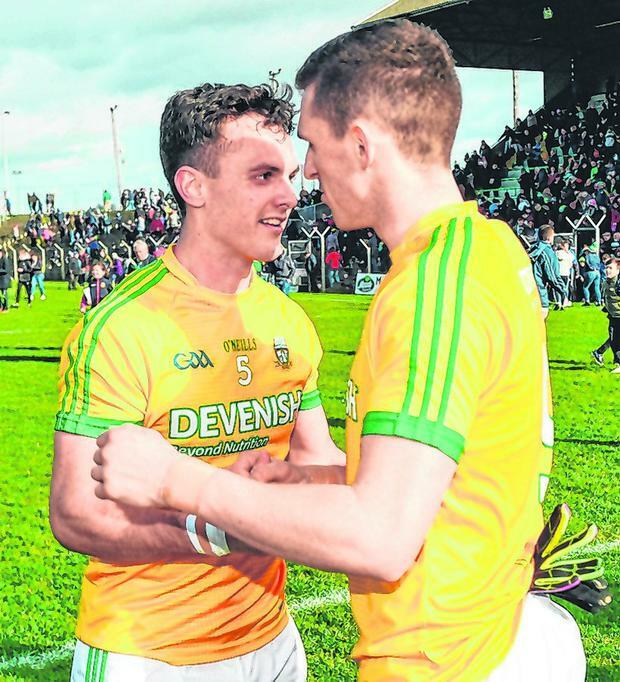 Meath, playing in front of a 6,500-strong crowd, took 16 minutes to get on the scoreboard through Cillian O'Sullivan which was the start of an unanswered 1-4. The crucial score of the half came when Barry Dardis found the net on 29th minute. At the other end, Fermanagh kept letting chances slip by. When Seán Quigley pointed a free on the brink of half-time, it brought to an end a 30-minute scoreless period for the Ulster men. And while Ciarán Corrigan's second point brought them to within a point at the break (1-4 to 0-6), manager Rory Gallagher admitted they had left too much behind them in their purple patch. "It's been a very good league for us even with the two defeats," said Gallagher, whose team went into yesterday's game with a chance of going up. "I would be very disappointed with the Armagh game but today I thought Meath were the better team but for 20-25 minutes we were by far the better team but we didn't finish them off. "So it's been a good league but there is an awful lot of learnings from it. Your expectations change after a while; we pride ourselves as a management team as being very ambitious and while we are satisfied to stay in the division, it's tinged with huge disappointment we didn't get over the line in the last two games." A year ago, Tipperary came within a win of going to the top flight with manager Liam Kearns suggesting his team might be better served with another year in Division 2. Gallagher doesn't see it that way. "I'd be totally different, we were sitting after five games and we won three and drew two and in my opinion we should have won all five games. What's disappointing for me is that we didn't beat the two relegated teams and we had a hell of a lot of wides. 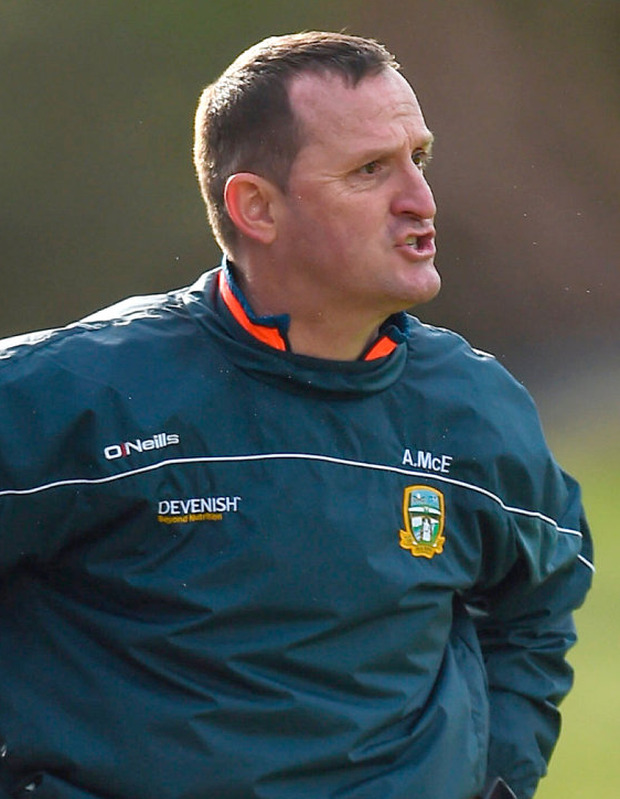 "We had a goalkeeping error against Tipperary for a crucial goal… Yes, if we went to Division 1 I have no doubt it would be very tough but it's a short life and Fermanagh isn't a county that generally finishes 11th in the league but we'd like to be in the top eight." Fermanagh kicked the first point of the second half to tie things up but with Meath overturning the Erne men's early midfield dominance, they looked comfortable. Mickey Newman, Brian Menton, James McEntee and Dardis all hit points before the Royals struck for their second goal. A brilliant Bryan McMahon sidestep cut open the Fermanagh defence and he fed McEntee who put Meath seven points up. There was still more than 20 minutes to play but Meath had the spadework done. "It probably wasn't the prettiest and it wasn't maybe our best performance of the year, but it was about getting over the line today," Andy McEntee reflected. "After 10 minutes I'm sure there were people getting a little bit giddy in the crowd so in that regard fellas steadied the ship pretty well and got the job done." And he was pleased with how his side dug things out. "We're talking about these things for a long time; resilience, mental toughness, grit, whatever you want to call it. It is hard when a team gets a run on you to stop momentum and that was pleasing." 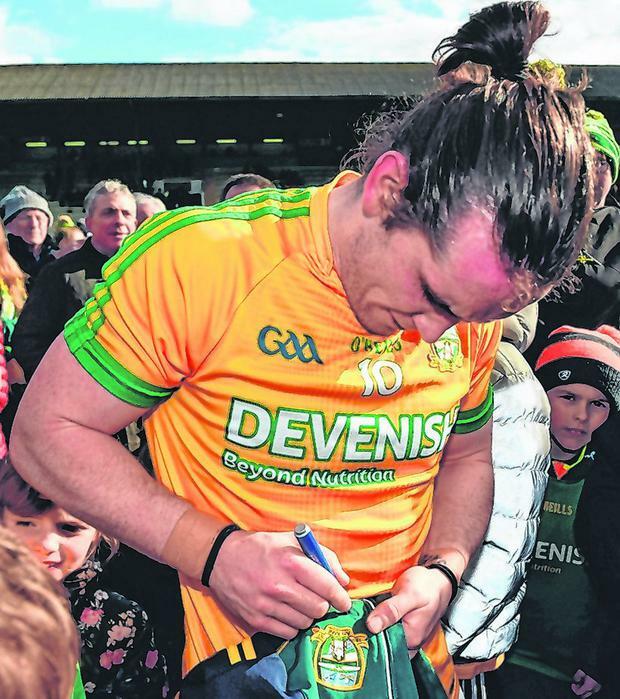 Now Meath prepare for another crack at Donegal in Croke Park. "The goal for this team was to get promotion. It's not a cliché, we haven't even talked about it, we haven't mentioned it (the league final). We didn't know who we'd be playing so what was the point talking about it? "It's nice to be going to Croke Park, it's nice for the Meath supporters to be going to Croke Park but the bottom line was that promotion was the important thing." SCORERS - Meath: C O'Sullivan 0-4 (1f), B Dardis, J McEntee 1-1 each, M Newman 0-3 (1f), B Menton, B Brennan (f), J Conlon 0-1 each. Fermanagh: R Jones 0-3, C Jones, S Quigley (1f), C Corrigan 0-2 each, U Kelm, D McGurn (f) 0-1 each. 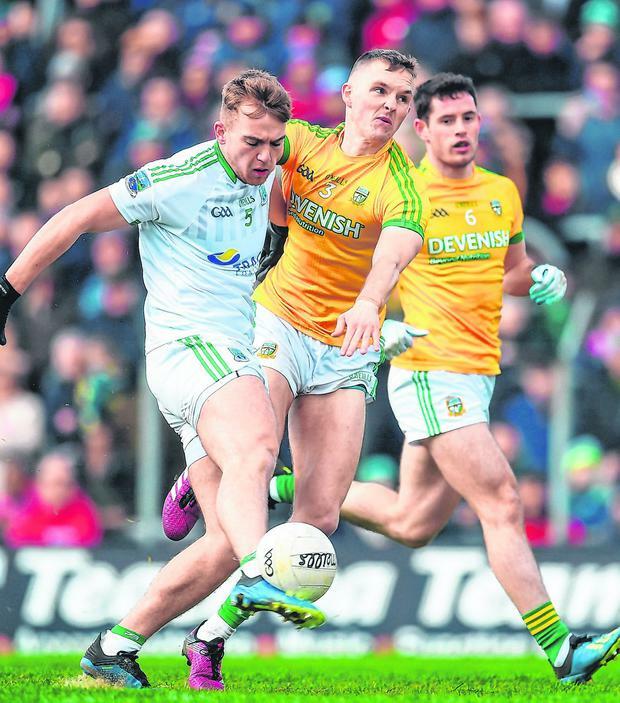 Meath - A Colgan 8; S Lavin 7, C McGill 7, S Gallagher 7; J McEntee 8, D Keogan 8, R Ryan 7; B Menton 8, S McEntee 7; C O'Sullivan 8, B Brennan 7, B McMahon 7, B Dardis 7, M Newman 7, T O'Reilly 7. Subs: G Reilly 6 for Brennan (h-t), D Campion 6 for McMahon (55), A Flanagan for S McEntee (61), G McCoy for Gallagher (64), J Conlon for O'Reilly (65). Fermanagh - J McGrath 7; L Cullen 6, C Cullen 8, K Connor 6; U Kelm 6, J McMahon 6, C Corrigan 8; E Donnelly 6, R Jones 8; J Cassidy 7, D McCusker 6, A Breen 6; R Lyons 6, C Jones 7, S Quigley 6. Subs: P McCusker 6 for Lyons (45), D Teague for Klem (50), D McGurn for C Jones (55), T Clarke for E Donnelly, C McGee for Breen (both 58).